Ideally situated between Bourbon and Royal Streets in New Orleans' French Quarter, Hotel Mazarin's recent restoration captures the area's spirit with chandelier-and-marble elegance and a courtyard centering around a copper fountain. Delicate wrought-ironwork and arched windows complete the Vieux Carré effect. The guestrooms' smooth, dark marble floors are complemented by pale neutral colors on the walls, gold accents and white plantation shutters opening onto the courtyard or Bienville Street. The bathrooms feature big walk-in showers. Two complimentary bottles of water and free wireless internet access come with your room. The tables around the courtyard's fountain are a peaceful and picturesque setting for the complementary continental breakfast. Famous New Orleans wine lover and bon vivant Patrick Van Hoorebeek hosts Patrick's Bar Vin, a French Quarter wine bar popular with locals and travelers alike. The room is richly decorated in red and gold tones, and tall French doors open onto a private courtyard for outdoor sipping. 21st Amendment at La Louisiane is a speakeasy-style bar overlooking Iberville Street; photographs and décor pay tribute to the building's history as a watering hole for local mobsters. Fresh fruit, hot eggs and sausage and grits are part of the complimentary breakfast buffet. The Queen Anne Courtyard, La Louisiane Bar & Catering (a private dining venue adjacent to the hotel) and a selection of elegantly-designed meeting rooms offer event options for up to 175 guests. 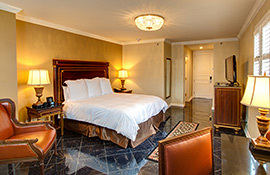 Hotel Mazarin is in the French Quarter, half a block from the nightlife of Bourbon Street and the art galleries and restaurants of Royal Street. Reservations must be cancelled 72 hours prior to arrival to avoid a penalty of one night room and tax. Your credit card may be authorized for one night room and tax 72 hours prior to arrival. Special Event Policy: For reservations over high-demand periods such as Mardi Gras, French Quarter Fest, Jazz Fest, Essence Festival, Voodoo Festival, New Year's Eve, etc., non-refundable first night room and tax due at the time of booking. Remaining balance due 30 days prior to arrival. All deposits are non-refundable once paid. Whether you're staging your special day, an intimate dinner, an executive meeting, or an elaborate theme party, Hotel Mazarin's facilities ensure that space, and style, are never an issue. Hotel Mazarin is one of the most sought after wedding destinations in New Orleans with its beautiful Queen Anne courtyard and La Louisiane wedding venue. For business discussions, you will find unique space for catered events and separate areas for breakout sessions and coffee breaks. The Mazarin also offers guests free breakfast, and a free welcome cocktail at the 21st Amendment Bar.